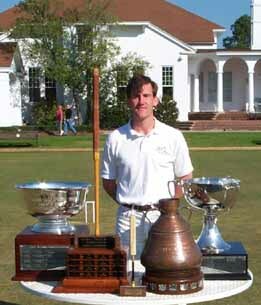 In winning the 2001 Country Boys Croquet Tournament singles title, Paul Scott becomes the simultaneous holder of four impressive trophies: the Country Boy’s Copper Kettle, the Francis Tayloe Trophy for the North Carolina State Championship, the Jack Osborn Trophy for the National Doubles title, and the Rudulph Carter Trophy for the National Singles title. Previously, Damon Bidencope was the only player to have won all four of these titles, winning each of them once between ‘87 and ‘93. The only events Scott has entered this year and not won are the NC Open (international rules) and the Country Boys doubles. The Country Boys singles final was a reprise of the Nationals final three weeks earlier. In both finals, Jeff Soo won the toss and chose to play first. In both finals, Soo never took croquet. Scott made two major blunders in the Country Boys final, but in each case regained the initiative with a spectacular shot. Scott and Soo have, between them, won the last five Country Boys tournaments. Scott won in ‘97, ‘98 and ‘01, Soo in ‘99 and ‘00. This year’s event was stronger than ever. The twenty players had an average handicap below 1.